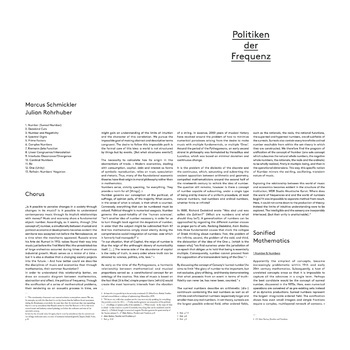 Following an hypothesis according to which “Music and Economics share a fundamental object: number”, Schmickler and Rohrhuber’s project POLITIKEN DER FREQUENZ circles around the acoustic rendering of number concepts. Inspired by Alain Badiou’s Le Nombre et les Nombres and accompanied by mixed choir, the piece attempts to question the apparent immediacy of number that allows calculation to govern today’s economy, social sciences and everyday life. "Change, flexibility, and movement are considered desirable today, while the static, rigid, and unchanging tends to be met with reservation or is implicitly opposed. Movement, perhaps even chaotic movement, or some form of change of the change of the change, appears promising: it suggests the invention of the new, rather than the discovery of the already-there, it is taken as the core of the revolutionary, or at least of the progressive. The unchanging, then, is only a brittle ladder to be used and then thrown away, a dead tool that merely points to life, or even a conservative prison of standardization. By consequence, what seems to exist in movement and nothing more, indeed appears in a favorable light: sound. Another version of the piece was commisioned by WDR3 Studio Akustische Kunst. Premiered November 2011. A joint release between Editions Mego & Tochnit Aleph.